In response to questions asked about DRO and visiting there I thought I would do a "Journey " there. Obviously for those who use it regularly and have walked this way many times before it will be a "boring walk" so if you don't want to go I understand. Where is DRO (Derbyshire Record Office)? It's in Matlock,which is eighteen miles north of Derby and a half hour by rail, or bus TP (Trans Peak) or one hour using R 61., or if coming from Chesterfield served by bus hourly (No 17). There are no other rail connections, unless you count the one in the park which goes in a straight line and goes straight back again. There is a steam train that does run from Darley and maybe near Rowsley, but I think that is only weekends and as DRO do not open Saturday's that's no good is it. TP by the way will bring you from Manchester a two hourly service. There are other services by bus but they are basically within the county itself. So you most likely will come by car or hobnail boot. There is a car park at DRO. It is not the largest in the world. It has around fifteen to twenty places. There is a large car park in Matlock near the railway station, but I believe you will have to pay there. The County Hall car park up the road has a large car park which you can use, (the Census is held at County Hall) but you may have to drive road a bit on certain days before one of the hundreds of spaces becomes available. A bit like trying to get into hospital car parks. DRO is situated on New Street, it is sign posted. 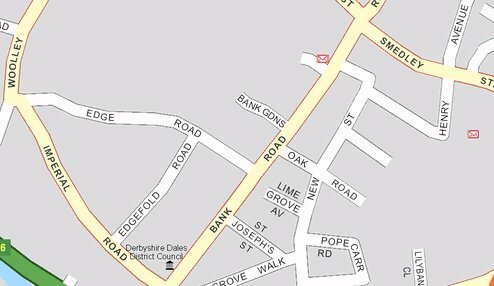 They will issue directions to you before your visit so no worries there, but just in case you lose the directions, make for the Post Office which lies at the base of Bank Road, the very steep hill in Matlock where the trams used to run up and down. You will be pleased to know that Census seekers will have to walk up this hill to get to Local Studies Library at County Hall. There are buses up the hill, but as I generally run up there, I don't catch them so I don't know the times, I also tend to use the flat route to Local Studies, but that is because I live on a flat route to it. Of course if you have a car no problem unless you have no brakes or the elastic band is running floppy. The car park is on your left going up and on your right going down. It is just past an old house that sells bread cobs and food snacks if you are going up and just after a major junction near the Gate Inn if coming down and has a large opening. On your way down you will notice on your right an opening like what horses went through, with a rounded arch, Local Studies is just inside there on your right up some small steps. I am sure there is access from the other end on a level walk. Directly opposite the opening to the car park on the corner is where Mr Palmer's (he of Wirksworth website fame,) ancestors lived. That has now got you to Local Studies, and you thought we were going to DRO. Incidentally before we leave Local Studies, all you do is sign in there, but it is advisable to book a reader. Telephone No 01629 580 000 and ask for Local Studies. To get to DRO however from Derby or coming via train, as you pass over the bridge you will come to a roundabout, there are traffic lights just before it. Go straight across (if they are green,) and you will be heading up Bank Road, you can't miss it, it's the one with all the people carrying oxygen bottles on their backs. You need to turn right at the first junction, Wilko's on your left, Post Office on your right. After turning right then turn left at the second turning. An awkward junction but this is where DRO is situated. Go up this road and DRO is on your right about fifty to a hundred yards from the junction. You can however go over the junction at the Post Office and Wilkos and turn right at the second turning, this is about half way up Bank Road and has a large church on the corner, there is also a church on the first turning right so make sure you turn at the second turning. From that Bank Road turning turn right and the DRO is on your left, and swing into the car park, gently because I may be coming out. I mention both routes because if you want to walk into town the first one is the quickest though in reality there isn't much in it but you will get to the shops on Firs Parade this way. Firs Parade has a Woolworths, a book shop, Kwik Save and Co-op, the Library is also in this area, (no don't get confused, not Local Studies). There is also a cafe at the top of Firs Parade and at the bottom of Firs Parade past Woolworths is a chip shop where you can eat in. The Firs Parade area was once called Frog Meadow, which was very clever of the frogs and no way were they going to hop up to DRO. So stayed in the hollow. There are also various pubs where you can get a meal . Opposite the chip shop is a very nice large park where you can sit and eat your chips if it's fine and feed the ducks on the boating lake if you like. You can stroll along the riverside working off your pie before going back to DRO. DRO has no facility for food, it has no telephone so you cannot order a pizza, hence the reason for mentioning the shops. Getting out of your car in the DRO car park make for the big tree through the gates, not the ramp. DRO entrance is up some steps,obvious where the entrance is. DRO has access for those needing to use a wheelchair, just ask inside or ring a bell and staff will gladly come and show you which entrance to use. Inside if going for the first time which you are, enter into the brown swing doors and announce your arrival at the desk. Quietly. It is a "library situation", you are almost in the inner sanctum and some serious stuff is taking place here. You will be asked to fill in a form, show two pieces of evidence confirming your identity, a driving licence and a bill with your name and address on it will do. Unfortunately they will not pay your bill, but it will gain you access to the Record Office. Your hat and coat you hang up outside in the foyer, where there are lockers in which to put your personal belongings. Put them in there and take the key with you into the Record Office, keep it until getting your belongings out of the locker. The toilets are in this area including one for those who use wheelchairs, who also have a table within the Record Office for there use should they need it. The records, are produced at certain times of the day, 9.45, 10.15 or 10.30 can't remember this one,11.15, 12.00, 12.30, 2.00, 2.30, and the last at 3.45. These are for documents not on film or fiche. If you arrive after 3.45 you will not be able to obtain any original document, unless you have pre-ordered it and for these you will need the reference number. You are allowed three documents at any one time, that is for each person, but you cannot order a "days worth" at once. Other records are on film and it is self service. You will if coming from a distance need to book to avoid disappointment if wanting a microfilm. They also have a map table, so if you need to look at maps you may need to book that as well, although they may let you use the smaller ones if you haven't got a large map out. There are personal name indexes, place name indexes and of course the numerous maroon volumes of catalogued deposits. For any item or document not on film, a slip has to be made out and handed in at the desk in the middle of the room where it sits until the back room boys, who fetch and carry your documents. Collect it at the aforementioned collection times. Take time ensuring you use the correct reference number for your item, it will save time and you will avoid the disappointment of not getting the right item. Occasionally the lads in the back will bring the wrong item, knowing how much stuff there is back there it's no wonder, but they will go and get your right item should that happen. Usually you get your documents within ten minutes or earlier from collection ,but on busy days this may take longer. They are doing there best. You may find that the film you are reading is difficult to read, poor filming, faded writing, ink bodges etc. Ask the duty archivist for the original if you feel you need to see it. You may find that they themselves will read the film, or check the original for you, but you may also have the original yourself if the archivist decides that is the best way. They make the decisions. For original registers difficult to read they do have an ultra violet light. Just ask for it. When using microfilm, there will be a red box near your machine which you will put in the place of the microfilm you are taking out. One microfilm at once. It is annoying to find the wrong film in the wrong box because someone took out two films and put them into the wrong boxes. Also remember to re-wind your film back to its original starting position. Most of the readers are different and thread differently so you may end up with a reel which is upside down or looks as if you are reading through a mirror, all because someone failed to follow this basic instruction. We've all done it, but a timely reminder will not go amiss. You can only use pencil at DRO but if you forget they have some. The staff are helpful, and busy. And sometimes very busy, other times no one is in. It's a bit like rush hour, sometimes we have to be patient,other times we have a free road ahead. There is one other thing. They close at 4.45. Like most people they like to go home on time, and it's usually then you will find the missing piece to the jigsaw, it's the one thing I have a problem with. I'm working on it. Hope you have enjoyed your "Journey". Mike (without Patricia) who prefers the great outdoors. Central Trains, First North Western, Midland Mainline, Transpennine Express and Virgin Trains. You will notice that some places are outside of Derbyshire, Sheffield,Yks, Uttoxeter and Burton Staffordshire. I am not certain if you have to buy your ticket in Derbyshire first, although it is listed as "Sheffield to Derby". So maybe you can buy them in Sheffield at the rail station booking and ticket office. The cost of seven pounds and 50p also includes one child or dog. For a group ticket at twelve pounds up to two adults and three children will work out cheaper if two, say husband and wife travel. You don't need the kids. The tickets are available from rail stations, Tourist Infomation Centres, found in most larger towns, and on certain buses or by Post from Derbyshire County Coucil County Hall Matlock Derbyshire, DE4 9BR. They are scratch card based, you rub of the covering over the dates,so they remain valid until you scratch the date of travel off. Phone DCC on 01629 580000 ask for extension 6738 to order tickets with a credit card. Timetables are available at TIC and Libraries for 60p. Three books cover the whole county. The rail one is free, but ask for it.